Israel's president meets with AIPAC delegation visiting in Israel, condemns PA Chairman Mahmoud Abbas' statements. President Reuven Rivlin on Monday, held a meeting at his residence in Jerusalem with a delegation of the American Israel Public Affairs Committee (AIPAC) Board of Directors. AIPAC is a lobbying group that advocates pro-Israel policies to the Congress and Executive Branch of the United States. The bi-partisan group, led by AIPAC’s president, Lillian Pinkus, included leaders from across the United States who were visiting Israel to engage with policy leaders and senior officials. Rivlin thanked the group for their unwavering support for Israel, on both sides of the political divide and across the country. “The true power of AIPAC was, and always will be the people. You, and so many people like you all around the United States are what makes AIPAC so great,” he said. “He forgot to mention a good many things, and said exactly the things that led him to be accused years ago of anti-Semitism and Holocaust denial. 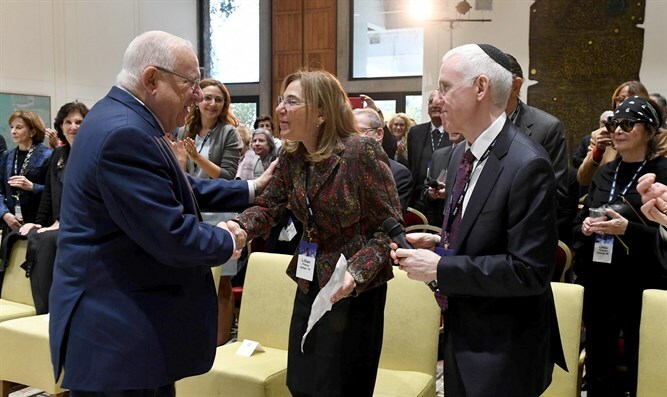 Speaking about Israel’s achievements and challenges as the country marks its 70th anniversary of independence, Rivlin mentioned his pride in Israel’s successes in everything from academia to economy. He also mentioned the importance of continuing to build understanding and shared hope among all the different communities of Israel, and of the important role played by Jewish communities around the world who are partners in this important mission.